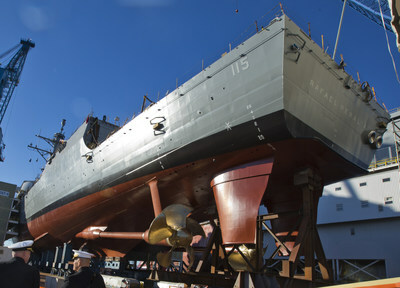 BATH, Maine, Dec. 21, 2018 /PRNewswire/ -- The U.S. Navy has awarded General Dynamics Bath Iron Works a contract to build a fifth DDG 51 destroyer as part of the multi-year award announced in September. General Dynamics Bath Iron Works is a business unit of General Dynamics (NYSE: GD). In the most recent multi-year competition, BIW was awarded four ships. The Navy held a separate competition for an option ship as part of its commitment to growing the fleet. The Arleigh Burke class destroyer will be funded in the Fiscal Year 2019 budget. "Bath Iron Works is privileged to continue producing state-of-the-art surface combatants for the longest running naval shipbuilding program in our nation's history," said Dirk Lesko, President of Bath Iron Works. "This award demonstrates the vital role the DDG 51 plays in the security posture of the United States and the confidence the Navy has in our shipyard to produce these important assets." There are currently five DDG 51 destroyers in production at Bath Iron Works: Daniel Inouye (DDG 118), Carl M. Levin (DDG 120), John Basilone (DDG 122), Harvey C. Barnum (DDG 124) and Patrick Gallagher (DDG 127). The shipyard's backlog includes Louis H. Wilson Jr. (DDG 126) and the five ships that are part of the multi-year contract awarded in this fall. BIW also is building the third Zumwalt-class destroyer, Lyndon B. Johnson (DDG-1002).